I was introduced to pickled peppers only a few months back. Before that, I thought chili peppers were used to make only fritters or at the most, it is used to flavour certain rice dishes. Thanks to blogging. I was introduced to a gamut of dishes, cuisines and pickled peppers. A few days back, my vegetable vendor brought these gorgeous looking chili peppers and I got so carried away that I ended up buying quarter kilo of these chilies. At first I thought of making fritters. But S is not too fond of them so the only other way I could use these chilies were to pickle them. I Searched the net for some recipes and I found this recipe here. It was as easy as 1-2-3 and it wasn't that time consuming. In short, the recipe was perfect. So I decided to go ahead and pickle these peppers. I knew that these pickled chilies could be used in salads, sandwiches and maybe I can create a dish that could accommodate these peppers. For a spice craving person like me, this condiment is just the thing to be had in the refrigerator. It took only 15mins of effort to make this. With that kind of effort I know I have something that will spruce up my taste buds for at least a few months. Wash the jar and the lid you want to pickle in in hot water and warm the jar till completely dry. Alternatively you can microwave for a min. Pack the sliced peppers in the jar and pour the brine over the sliced chilli peppers and allow to cool and close tightly. This can be refrigerated for upto two months. 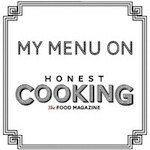 You have a beautiful blog and I love this pickled chilli pepper too. A must have to go with our asian noodles :) I am your follower now :) Have a nice day ! 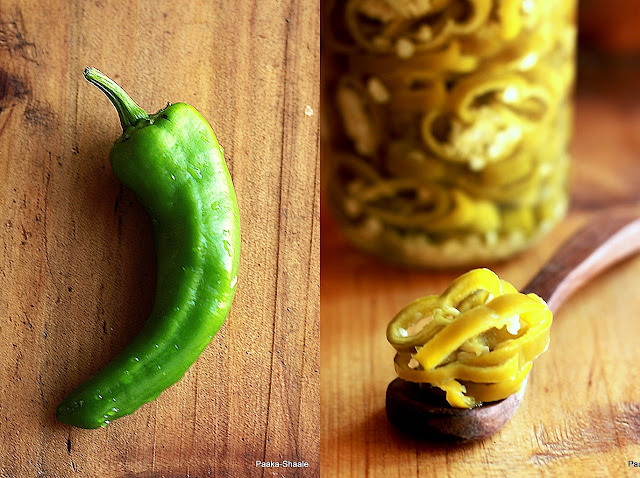 I preserve jalapenos similarly, love the tangy, spicy chili pickles. Beautiful! ya even buy this chillies and to make fritters ..but end up adding to some dishes..pickling it is a good idea..
Love this extremely irresistible pickled chilli peppers..Beautifully done. I love pickles...what a great idea! And your photo is fantastic my friend. Pickling is such a great kitchen technique. Preserve and add flavor at the same time! These look great. ha ha ha I just pickled some jalapeno yesterday :) I find it hot but the husband somehow loves it! Wonderfully spicy! I love pickles. Although I don't eat spicy food (a little bit is okay), I love these pickled chilli peppers pictures! I know it's Ramadan and everything but I swear that isn't affecting my opinion of how amazing these pickles look right now! ooohh...looks so yummy and spicy. I love pickled peppers, both spicy and sweet ones. Thanks for sharing and the inspiration. Me again:) Just stopping by to say thanks for being a part of the YBR. yum! these look great and easy! two of my favorite things! One of my fav. chutney..love it with hot parathas! Lovely clicks. Pick enough chillies to make 1 cup of chilli pulp about a desert bowl full of fresh chillies should do it and wash. There is no need to de-seed the chillies. These are absolutely amazing and great idea. Its looks perfect .Thank you for the awesome recipe.